SRINAGAR, Indian-controlled Kashmir (CNN) -- More than half of the voters in the eight states participating Thursday in India's general elections cast ballots for a new federal government, election officials said. A man gestures during an election rally in Srinagar. Turnout in Indian-administered Kashmire was 24 percent. 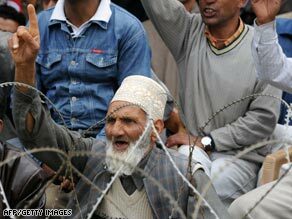 A man gestures during an election rally in Srinagar. Turbout in Indian-administered Kashmir was low at 24 percent. "Tentatively, the turnout in the fourth phase was about 57 percent," Indian election commission spokesman Rajesh Malhotra told CNN. His comments came after voting closed in the national capital, New Delhi, and the seven other states taking part in the fourth round of the country's five-stage elections. West Bengal, India's communist-ruled state, recorded the highest turnout Thursday of around 75 percent, he said. Overall, India has around 714 million voters, up by 43 million since the last general elections in 2004 that brought to power a communist-backed coalition led by the Congress party. Prime Minister Manmohan Singh's government lost support of the left parties last year for signing a civil nuclear cooperation agreement with the United States. Nonetheless, it survived with backing of a powerful regional grouping. Regional parties play a key role in forming the government in India, where the Congress party of Italian-born Sonia Gandhi and the Hindu nationalist Bharatiya Janata Party are main rivals. The fifth round of voting in the general elections takes place May 13, and the vote count is scheduled for May 16. Srinagar, the capital of the Indian-administered Kashmir, was one of the 85 boroughs across the country that went to the polls Thursday. The area was hit by anti-election protests and a separatist boycott in the days leading up to the voting. Turnout there was only about 24 percent, senior election officer B.R. Sharma told CNN. Security throughout the constituency was tight, and had been since Wednesday, when the poll parties were dispatched to their respective polling stations. Paramilitary and police troops patrolled the city and its suburbs. Many poll stations in the city were empty except for the poll workers, but rural polling stations had lines of voters in some places. The separatist leadership that called for a poll boycott was under house arrest in Srinagar. Hardline separatist leader Syed Ali Shah Geelani had also called for a 50-hour long strike ahead of Thursday's polling. The constituency envisages a direct contest between the ruling National Conference (NC) Congress coalition candidate, Dr. Farooq Abdullah, and the opposition People's Democratic Party (PDP) candidate and prominent Shia leader, Moulvi Iftikhar Hussain Ansari. Various rights groups and non-governmental organizations here, however, dispute the official statistics -- claiming that the number killed during the last 20 years is twice the official figure. CNN's Mukhtar Ahmad in Srinagar contributed to this report.